The online newspaper El Faro has reported that there is a split in the executive board which oversees the projects funded by dollars from the US Millennium Challenge Account. The division arises from the concern of certain members of the council that president Tony Saca is using announcement of various projects of the Millennium fund for propaganda purposes. These dissenting members are the representatives of the NGOs and the private sector who sit on the board. The governmental members who are on the board continue to support Saca. 1. No one should be surprised. 2. The Salvadoran people have seen such self-promotion by the current government often enough that they recognize it for what it is. The National Labor Committee describes its mission as helping "defend the human rights of workers in the global economy. The NLC investigates and exposes human and labor rights abuses committed by U.S. companies producing goods in the developing world. [The NLC] undertakes public education, research and popular campaigns that empower U.S. citizens to support the efforts of workers to learn and defend their rights." The IUDOP report describes the survey results on a wide variety of other topics showing the view of El Salvador's citizens on the economy, security, the government, and their own sense of well-being. 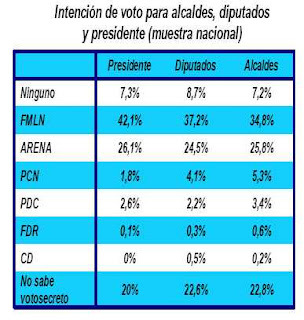 The predominant message of the poll is that Salvadorans believe that their lot in life is getting worse and the government is doing nothing to help them. A computer file purportedly discovered on a laptop computer at a guerrilla camp in Ecuador, has bloggers in El Salvador wondering what impact it will have and what impact it should have on the upcoming elections in their country scheduled for March 2009. The laptop computer was taken in the Colombian army's raid on the camp of FARC guerrillas in Ecuador. In that raid the number two man of the FARC, Raul Reyes, was killed, and his computer seized. The furor in El Salvador started when the Spanish newspaper El Paisdisclosed[es] that one document on the computer referred to a Salvadoran making an introduction in 2007 from the FARC to Australian arms dealers. The Salvadoran named was Luis Merino, a senior official of the left-wing Farabundo Martí National Liberation Front (FMLN) and member of the Central American parliament. The conservative press in El Salvador played up the story with prominent pictures showing Merino beside the FMLN's presidential candidate Mauricio Funes. As soaring food prices lead to hunger, the UN World Food Program sponsored a march against hunger and malnutrition in the streets of San Salvador on Sunday. Participants of the march included leaders of social organizations, diplomats, professors, students and workers, said reports. Carlos Scaramella, a WFP representative in El Salvador, said the march was designed "to create a movement of global solidarity for the fight against hunger and malnutrition." "It's very important to join this movement due to the threat ... of rising food prices in the world," he said. La Prensa Grafica has a photogallery of the march at this link. Remember -- the problem of food and hunger in the world is not that there is not enough food to feed everyone. The problem is distribution and the ability to pay for that food. For continuing coverage of the global food crisis, go to the special coverage at Global Voices. Among Guatemala, Nicaragua, Honduras and El Salvador, El Salvador had the highest price for corn, a price which has gone up 39% in the past year. In Guatemala and Nicaragua, the price of corn actually decreased over that time period.Although El Salvador had a record harvest of beans in the last season, the price of beans went up 60% in the past 12 months.The price of rice went up 66% in the past 12 months. El Salvador had the highest price among those 4 countries.The cost of a basic family's market basket of goods has gone up 21% in rural areas and 14% in urban areas during that time. On March 1 of this year, Colombian armed forces raided a camp of the rebel FARC guerilla group in Ecuador. The computers captured in that raid have produced information having ramifications in El Salvador. They represent only one side of a story, and most of their claims have yet to be independently corroborated. But Interpol has now concluded that the huge cache of e-mails and other documents recovered from the computers of Raúl Reyes, a senior leader of the FARC guerrillas killed in a Colombian bombing raid on his camp in Ecuador on March 1st, are authentic and undoctored. The documents throw new light on the inner workings of the FARC. On a fairly regular basis I receive e-mails from lawyers who are representing Salvadorans facing deportation from the US. The lawyers are often looking for information to support an asylum claim for person who fear gang-related persecution if they return to El Salvador. US law grants asylum to persons in the US who establish they have been persecuted or fear they will be persecuted on account of their race, religion, nationality, membership in a particular social group, or political opinion. A resource to which I will now direct those lawyers is the Gang Asylum Guide put out by the Washington Office on Latin America. The Guide presents an overview of the gang problem in El Salvador and other Central American countries and provides resources for making the argument that a former gang-member, or a person who fled gang recruitment, or other persons should be entitled to asylum in the US. When Bill Perkins, 39, took his first trip to El Salvador, he was not expecting much. "This is a country that, not long ago, was being ravaged by civil war," he says. "I was bracing for a lot of rubble and bullet holes." What he found, however, were well-paved roads, hotels packed with foreign investors and a populace with "a lot of fancy degrees". The country's 220-square-mile capital city, home to 2.2 million people, has been the site of numerous earthquakes throughout its history, most recently in 2001. A 6.0 quake would kill an estimated 11,500. GeoHazards also released a study in 2001 after the earthquakes which hit El Salvador pointing out that many measures to reduce the damage and fatalities those quakes caused are both feasible and relatively low cost. This week US military personnel participated in disaster preparedness exercises in El Salvador simulating response to a devastating earthquake. Upside Down World, an online magazine "covering activism and politics in Latin America" from a progressive point of view, has published a lengthy interview with Mauricio Funes, the FMLN's candidate for president of El Salvador. The interview is well-worth reading. The first question asks Funes to place his campaign within the leftward shift of politics seen in Latin America in recent years. Funes answer:We are often asked, ‘Well, what type of left do you represent?’, and I have said: “We represent the left of hope. We are a sensible left, a reasonable left, a left that is betting on change, a stable change. We are looking for a type of society that builds functioning institutions in El Salvador, a democracy that functions, a viable nation. The local residents and forensic experts are digging in the spot where the remains of five men and one woman are thought to be buried in La Angostura, a rural village in the mountains near the town of Ciudad Barrios, 136 km east of San Salvador. The exhumation work takes place Apr. 24-28. The current survey goes beyond simply tallying remittance totals and starts to probe the reasons behind the shift in remittance flows. The results suggest that two principal forces are affecting the lives of Latin American immigrants and the flow of money they send home. The first is the effect of the U.S. economic downturn on the sectors employing large numbers of Latin American immigrants. Impacting the incomes of workers directly, the downturn is clearly reducing the capacity of immigrants to support their families back home. The second, and perhaps more significant force, is the effect of the immigration climate which has been emerging over the past two years and is changing the dynamics of remittances to Latin America. A Washington, D.C. area television station, WJLA - ABC 7, has recently aired stories about Salvadoran families split between two countries by immigration. You can read those stories and watch the video reports here and here. Also worth reading is reporter Andrea McCarren's blog of their reporting trip to El Salvador which has short essays and photos on a number of aspects of life in El Salvador. There are recent updates in two murders and a new murder, which continue to raise the question: how do you know when a murder is politically motivated? It is a question I've asked before in this blog, especially when people are quick to assert a political motivation when few facts are known about a murder. The case of Salvador Sanchez -- Sanchez was the radio journalist who worked for progressive radio stations and was murdered near his home in September 2007, and some suggested a political motivation for the murder. This week police reported capturing a member of Mara Salvatrucha as the second suspect in the murder of the radio journalist, after arresting another gang member last October. At the food court in the Galerias Escalon shopping mall, a young restaurant employee is getting out the word. She passes out fliers advertising the lunch specials at Los Cebollines, including the $4.50 Super Ranchero combo. A few feet away, others are getting out The Word. Each day, the San Jose Chapel offers a Catholic mass and even the sacrament of reconciliation. For a few moments, dozens of shoppers and mall employees exchange Armani and Adidas for Matthew, Mark, Luke and John. Funes wants to remake the FMLN into a pragmatic party that, if victorious, would join El Salvador with Guatemala and Nicaragua as former Cold War-era battlegrounds where voters are trying leftist leaders for the first time since their conflicts ended. Not that those ideological battles are over. With 10 months to go before the March vote, conservative critics have painted Funes as a Trojan horse, a moderate face for a party whose leaders still wear fatigues and whose supporters brandish pictures of Che Guevara and Soviet flags at campaign rallies.